As I mentioned in my last post I am frantically trying to sew things for our forthcoming trip to India and I have also, finally, started to make a dress for the PTA ball I am attending in a couple of weeks time. More on that to follow. Today’s outfit was sewn because I thought it would be good to travel in: the viscose pants and top will keep me cool when we reach warmer climes but covered up at the same time, and I thought the ponte blazer again might be good to travel with on the plane (don’t know about you but I always find the a/c on planes too much). Something I have realised is, if I am sewing separates, I have to make sure I have something appropriate to wear to complete the outfit; otherwise the separate piece just doesn’t get worn! (OOP) McCalls 6291 for the printed pants. This is actually the third time I have made this pattern (a personal record for someone who doesn’t go back to a pattern all that often), and I think this time I have perfected the fit. Version 1 here; version 2 here. This time round I shaved a further 0.5 inch off each inner and outer seam, front and back i.e. 2 inches in total – this means I have now removed a total of 10 inches from each leg from version 1! I also raised the front crotch by a futher 0.5 inches from last time. This is a viscose print fabric purchased locally to me, and I have cut the fabric on the cross grain to make the pattern run lengthwise down the leg – less headache pattern matching and more flattering IMO. I also made the hem on this version slightly smaller; turning over 0.25 inch and then 5/8 inch. McCalls 6991 for the crossover wrap top. You can see the first version of this top here. This time I essentially made View A, but added the sleeves from View B and the tabs from View C. No other changes were made. The fabric is another viscose, purchased from Minerva Fabrics in the UK. I cannot vouch for the other colours of plain viscose in this range, but this red is amazing. Washes, drapes, sews and presses beautifully and is fabulous to wear. Plus Red. Uhuh. Wearing red makes me feel happy. I used gold buttons on the sleeve tabs to up the glam factor. Butterick 5926 for the ponte blazer (fabric purchased on ebay). 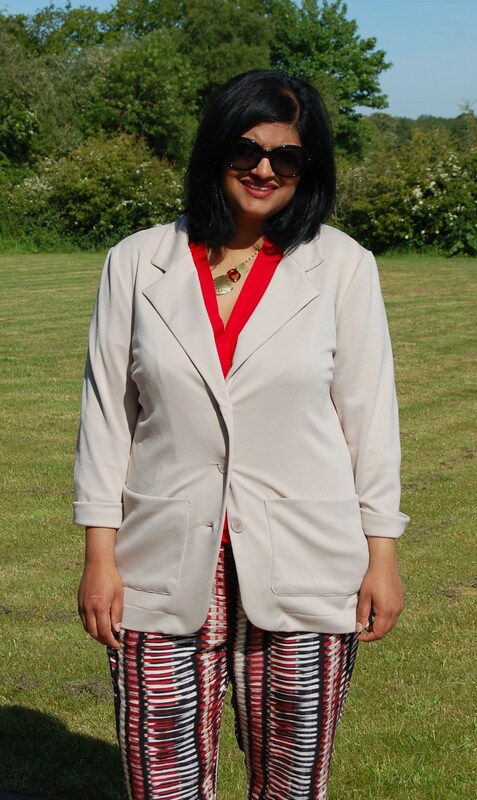 First version of this blazer was blogged here. No changes to the fit. To be honest, when I finished this blazer I was a bit meh about it. I had been so tempted to download the new Grainline Morris blazer but I just didn’t want the extra time taken on a completely new to me garment. However, I must say I have worn this blazer already, including for a full day trip on the train to see an old friend, and it is very comfortable. I think it’s the very (intentionally) bland colour that made me feel meh, and the facings are a bit skimpy but I think I will probably end up wearing this a lot. BTW, I used Craftsy’s Modern Jacket Techniques to learn how to sew a notched collar properly and I cannot recommend it highly enough. I will definitely be making myself a woven blazer in future using this class. 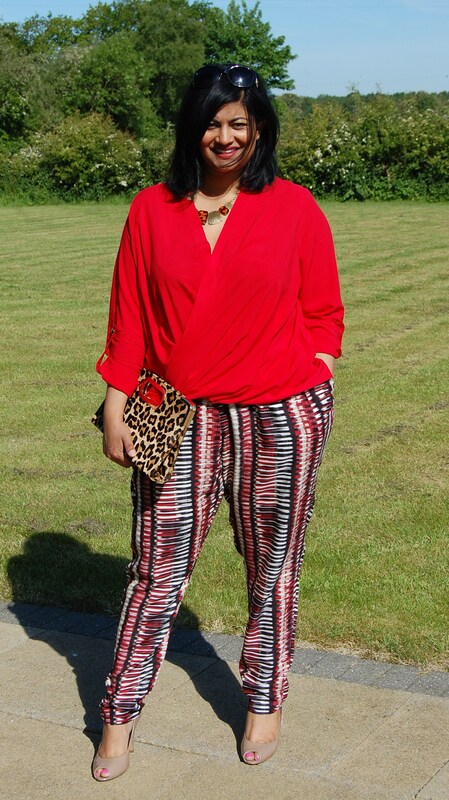 I am entering this entire outfit into the Plus Size Contest currently running over on PR.com. so head over if you want to see all the other entries. Terrific outfit, and it all looks really nice on you! Oh, I love this whole outfit – so chic, flattering, and comfortable, too! I don’t often repeat patterns either, but I see that it pays: while I love all your pants versions, this third one is definitely my favorite. What a great outfit; perfect for traveling. Good luck in the contest; you’ve got my vote!! Beautiful! I love all of the pieces and the colors as well. what a great outfit and love the colors on you. 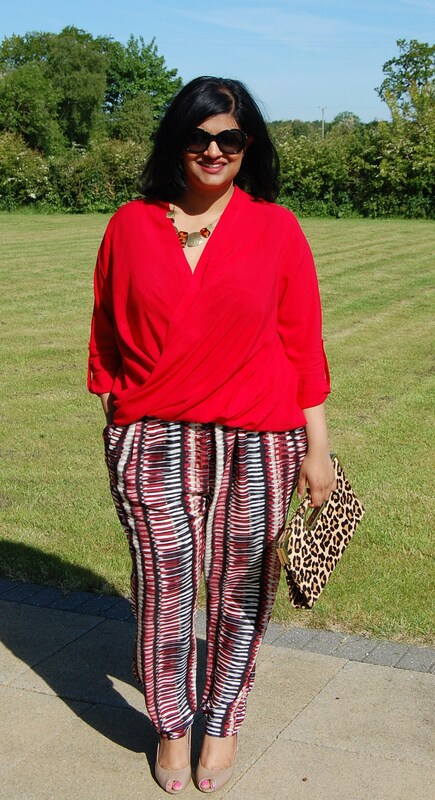 I especially like the choice of that fabric for the pants, the print gives a great verticality and I would never have thought of it for pants but it works perfectly. I love red too! 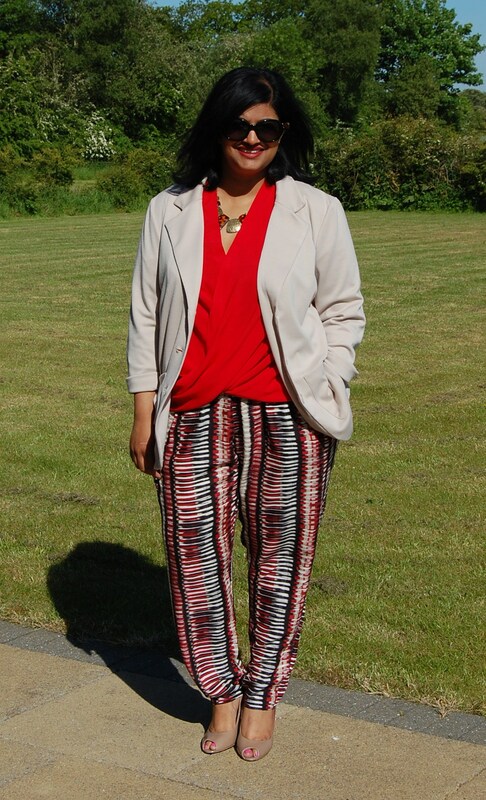 The top and pants coordinate well, and the neutral blazer coordinates with almost anything. Love the outfit. Fantastic outfit. The fabric for your pants is absolutely amazing! They are my favorite piece. Red is my favorite color and I love the patterns you used…as usual. The whole outfit looks perfect on you!!!! 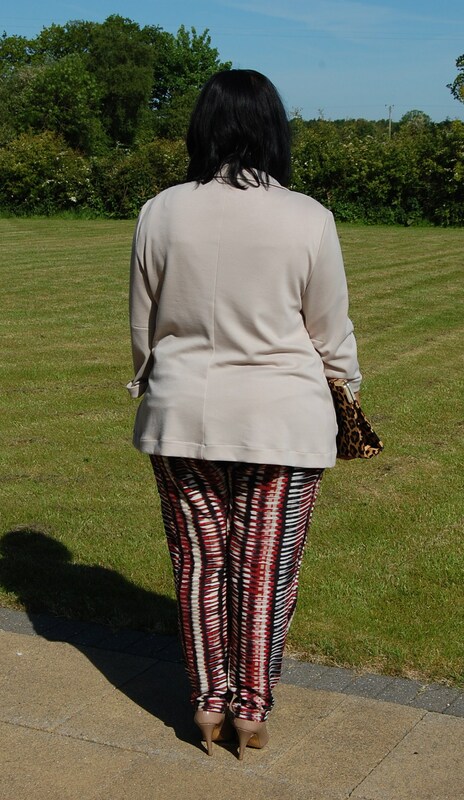 Fabulous outfit. I must do this more often and make pieces that all go together. I am getting better at it! Thanks Sam. Requires more work and planning but so worth it! This outfit looks great on you! 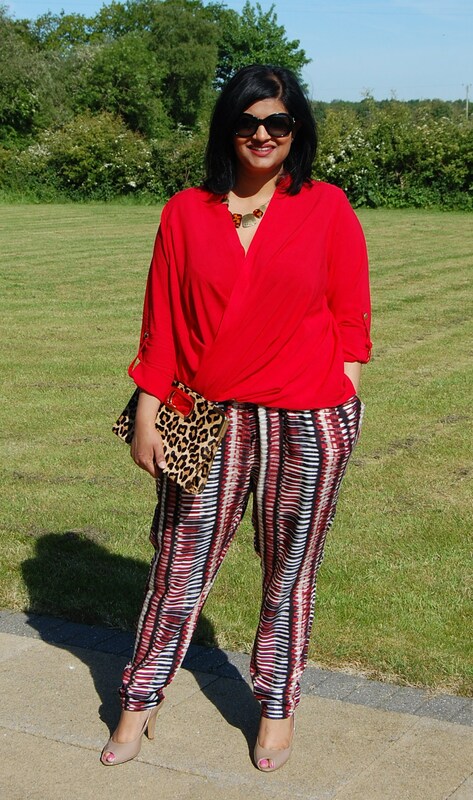 LOVE the printed trousers! I think this outfit is my favorite set of things you’ve made! I love it so much together!… I guess that’s the whole point of sewing, to make things but have them work together to pull together a fabulous look! Love the entire outfit. Those pants are my favorite. I love that outfit and those pants are wonderful! You are right – I need to plan more outfits rather than just pieces, because nothing goes with anything else! 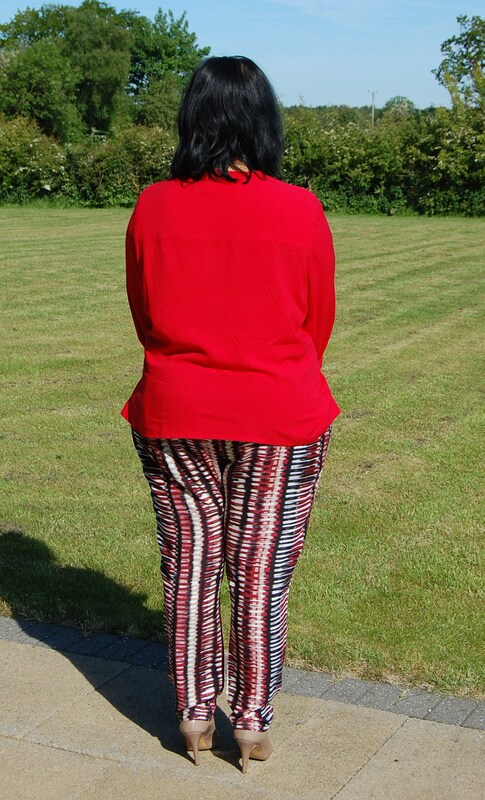 I’m inspired by you and think I might tackle proper pants this fall…. Thanks tinlizzie72. Hope you try your own pants. 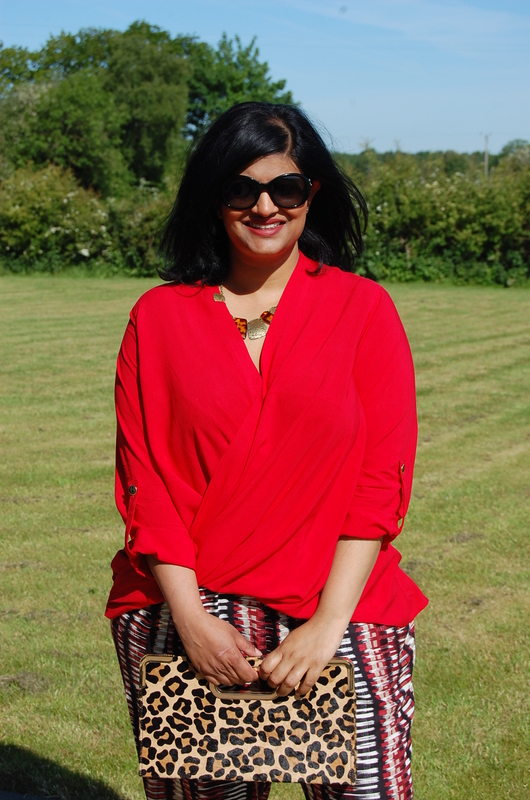 Manju, that red is beautiful on you! I have recently had the same epiphany about sewing separates. I am making a deliberate move towards sewing more with purpose. All three pieces are lovely, and worn together make a fabulous outfit. Good luck in the contest. What does the front panel pattern look like? Looks like a lot of fabric?